The path to enlightenment is lined with salty snacks, as far as Lindsay the life coach is concerned, and she’ll be happy to dole out some unconventional advice to you over a bag of Cheez Doodles. Pick your flavor. She’s so enamored with the Wise Foods brand, in fact, that she’s come up with “The Doodle Method” as a way to steer her clients in the right direction. Her motto: Why grow up when you can live young? The perpetually sunny Lindsay, an actor named Stephanie Hunt in real life, is the centerpiece of a scripted comedy series that represents the first significant advertising from the brand in decades. The 97-year-old Wise Foods hired Kastner & Partners, known for its groundbreaking Red Bull work, to try to catapult it from boomer fave to millennial must-have via original content that puts story first and tries to turn consumers into followers. It was important that a woman took the lead in the six-part series and its accompanying vlog, about a half-hour’s worth of content, according to the agency’s CCO Brandon Rochon, who called it a twist for the category. “The Doodle Method” unfolds on Lindsay Conner’s Facebook page and Instagram, where she suggests a “doodle break” at 4 p.m. to get from lunch to quitting time, posts daily affirmations like, “Don’t get stuck. Doodle-versify and evolve,” and becomes a published author (e-book only, much to her chagrin because she wanted to dole out autographs). The videos are short, subtly sarcastic vignettes that mimic single-camera sitcoms, blessedly free of a laugh track. In one, she and her friends try to figure out bitcoin, which they guess is “some kind of robot money,” and there’s a running joke about artisanal cocktails with ridiculous garnishes around the rim. There’s plenty of snack product in the episodes, often in the background. But the brand fingerprints are everywhere. Lindsay’s chair is always orange, and her Instagram-ready kitchen accessories are Doodle flavors instead of sugar, flour and coffee. 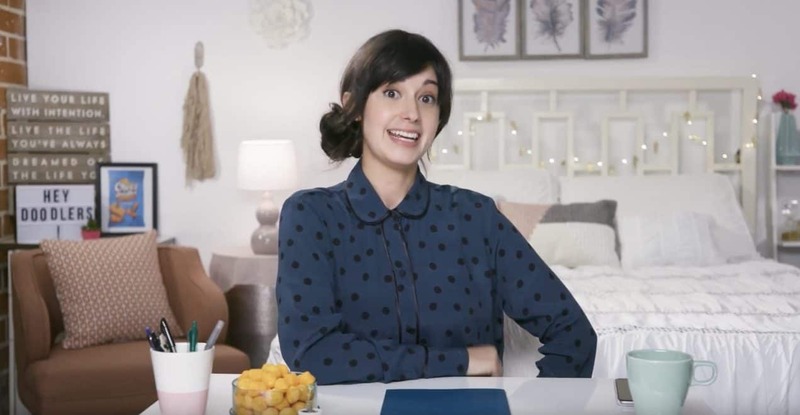 Cheez Doodles, a regional player dwarfed by large national competitors like Lays, was ready to go all in for a project that “wasn’t a commercial, but rather an enjoyable snackable, stackable series,” Rochon said, noting that “The Doodle Method” is the agency’s first work for the new client. Execs at the heritage brand had asked for something unexpected that would target millennials and Gen Z. “The creative, off-beat seemingly unbranded content is exactly what we needed for an audience that is tired of traditional advertising,” said Jeremy Bjork, CMO at Wise Foods Inc. Shot in Los Angeles by director Alex Buono with production partner Jash, the content’s snagged upwards of 1.3 million impressions in its first week (videos and vlog), and it’s getting a media boost via a Thrillist partnership. There are ongoing talks for a sequel. Meantime, Kastner & Partners already has developed a digital content series for another Wise brand that revolves around a four-day road trip with two strangers in a car.